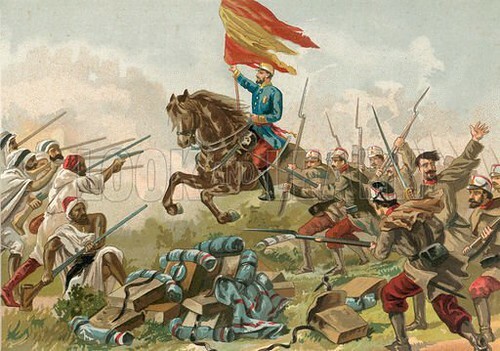 The Hispano-Moroccan War, also known as the Spanish–Moroccan War, the First Moroccan War, the Tetuán War, or, in Spain, as the African War, was fought from Spain’s declaration of war on Morocco on 22 October 1859 until the Treaty of Wad-Ras on 26 April 1860. It began with a conflict over the borders of the Spanish city of Ceuta and was fought in northern Morocco. Morocco sued for peace after the Spanish victory at the Battle of Tetuán. The Spaniards reached Tetuán on February 3rd, 1860. They bombarded the city for the following 2 days which allowed chaos to reign free, Riffian tribesmen poured into the city and pillaged it. The Moroccan historian Ahmad ibn Khalid al-Nasiri described the looting during the bombardment. On February 5th the Spanish entered the city, ending both the battle and the war.